One of the biggest key elements for success is ensuring that you have smoothly-managed start and finish lines. Fewer issues will arise and interfere with the timing results if a race is organized properly from the beginning . And we all know that race directors and race participants expect accurate, efficient time results. Here are a few tips to keep in mind at the start and finish lines. Set up cones or a barricades near the start to discourage spectators from getting too close. Have runners line up 10 minutes before the race begins. Then give them a 5 minute heads-up and 1-minute to warm up. Ensure that you properly mark the start direction. For events with up to 1000 participants, allow at least a 4-meter-wide start. For events with over 1000 participants, consider a 4- to 8-meter start. Set up cones, fences or barricades near the finish line. Keep spectators far enough away that the lanes are open for runners. Manage the crowds at the finish line adequately. This ensures that timing equipment, wires, clocks, computers, mats, etc.are not accidentally damaged or obstructed. Too much chaos could potentially hinder accurate timing results. 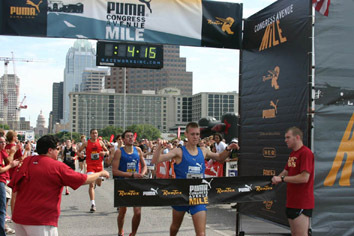 Finish lanes should be 2 to 4 meters wide for up to 1000 participants. For events with over 1000, consider at least 4-meter finish lanes. Be sure to keep your chip timer or race timer informed. All issues, changes, or anything at all related to the start and finish lines. It’s very important they understand all aspects of these areas. There are usually RFID antennae and mats that need to be specifically placed in order to be effective.